The kitchen/breakfast room sits at the heart of the house with feature vaulted ceilings and the breakfast area set to overlook the delightful gardens and grounds to the rear. There are generous unit and wall cupboards with a large island and aga. Continuing on the ground floor there is a very cosy snug with open fireplace a further impressive drawing room with a large open inglenook fireplace and a further sitting room creating a fabulous area for entertaining. There is bedroom and shower room on this floor which has been proven to be very convenient for elderly relatives but this would also work well as a home office. To the ground floor there is a very spacious guest bedroom with a modern shower room which can conveniently be accessed by its own front door. The utility room is also on this floor. A bright and modern extension leads to the first floor where four bedrooms and two bathrooms are located. The master bedroom suite is generous in size with built in wardrobes and a modern en suite shower room. There are three further bedrooms one of which has an en suite loo and a modern family shower room services the other rooms. the ample driveway provides parking for several cars. Agents Note: A footpath runs along the Eastern boundary of the property. Mount Noddy cottage is situated in an Area of Outstanding Natural Beauty close to the centre of Danehill, within close proximity to Ashdown Forest and Cumnor House School. There is a plethora of highly regarded schools in the area both state and private, including Danehill C of E primary school, Cumnor House, Great Walstead, Ashdown House and Brambletye prep schools, Warden Park, Ardingly College and Hurstpierpoint College. The larger regional centres in the area, Haywards Heath and East Grinstead are about 6 and 9 miles respectively, both provide mainline train services to London. From Haywards Heath there is a mainline train service to London (London Bridge/Victoria about 47 minutes). 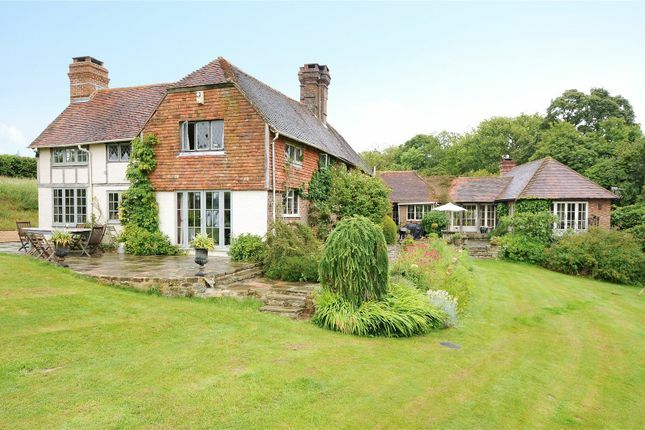 The property is set within a glorious plot of around 20 acres with outstanding far reaching views of the South Downs. The land is divided into formal gardens which also include a stunning landscaped salt water swimming pool and then there are further paddocks and fields, ideal for grazing. Within the top fields are two Shepherd Huts and various outbuildings including an outdoor loo and converted stables into a useful outbuilding. Property descriptions and related information displayed on this page, with the exclusion of Running Costs data, are marketing materials provided by Hamptons International - Haywards Heath Sales, and do not constitute property particulars. Please contact Hamptons International - Haywards Heath Sales for full details and further information. The Running Costs data displayed on this page are provided by PrimeLocation to give an indication of potential running costs based on various data sources. PrimeLocation does not warrant or accept any responsibility for the accuracy or completeness of the property descriptions, related information or Running Costs data provided here.